Discover color with this bright table lamp that features a multi-colored base crafted from stacked glass elements. A cheery table lamp in soft colors that's complemented by an elegant stacked glass design. A deep orchid lamp shade adds a fun touch. While a clear base completes the design for a chic look. Overall: 21" high. Shade is 5" across the top x 9" across the bottom x 10" high. A colorful lighting accent from the Regency Hill brand. Multi-color glass base table lamp. I ordered it for 1 Grandest Daughter and we all loved it that we all decided another Granddaughter needs to have this as well. i liked all the beautiful colors. Liked the colors. Matches well with our decor. Awesome colors. Brighten up my farmhouse bedroom. Love the colors in the lamp base and the price! I like the beauty of the lamp. The exceptional and different color of the shade....and the shiny multicolored stacked glass feature!, Perfect for my bedroom. It will look very nice in my Pink Themed Bedroom! It is perfect, just what I was looking for. Daughter's room needs lighting along with pops of color. Appears as though it will match the bedding perfectly. My bedroom is orchid, my quilt is a lilac and white Laura Ashley print, so this lamp I think will b perfect to complete the look. This is a gift and the favorite color of the receiver is red. matches my pink flamingo and pink desk! To me this Lamp look super Gorgeous!! I pray it looks that way when I get it. BEST ANSWER: It’s lightweight at about 2.5lbs. What kind of lamp shade a spider or harp or something else? BEST ANSWER: Hi - the shade included is an uno type lamp shade. 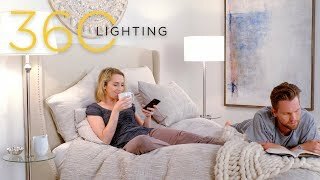 Does it have much lumination to be able to read on bed and what color is it when turned on? BEST ANSWER: Most can definitely read by a 60 watt bulb. But, I have added an LED bulb below which will have an equivalency to a 75 watt incandescent bulb you can use. Yes it does have enough lamination to be able to read by, I bought it for my daughter room. The color is hot pink when turned on. I don't find it bright enough to read by and knew this when I bought it; wanted a general illumination. How would you best describe color of lamp shade? BEST ANSWER: I'd call it raspberry. It's a nice color and looks great when it's lighted. Vibrant and elegant. My daughter and I love it. The lamp I got had a light purple shade. A shade of purple and it lights nicely. Is the lamp shade a silky material or what else? Yes, the shade is well-made with the typical silky feel of a good lampshade. Is this lamp vintage or modern? BEST ANSWER: Neither, really. It's little girl's room ish. The entire lamp lamp looks gaudy. Is it that way in person? BEST ANSWER: I would not call it gaudy. It is quite lovely. I bought it for my granddaughters bedside table and it was the perfect size and much lovelier than expected. If you are not a colorful person then you would say it looks gaudy to you. Choose another lamp. But it is a very classy, colorful addition to any room and adds that pop of color. It looks like the picture but I don't consider it gaudy. It's fun and different. No it's not gaudy. I've gotten many compliments on it at my work. a little but in an understated way! Higher quality than I expected for the price. 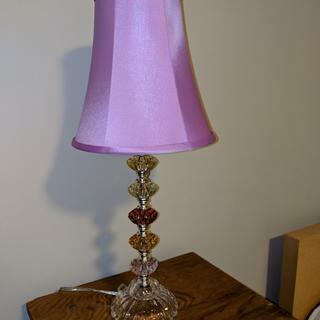 However, the "bright pink lamp shade", is exactly as it looks online. Not pink at all. Maybe more like purple/magenta. A little disappointed with that, but it's also a high quality satin, so I'll work with it. Really good value! 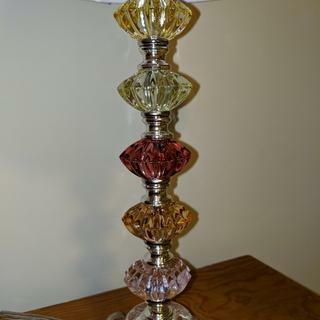 This is a well made lamp and the base is super-pretty with the multi-colored stacked glass. However, the shade is not a deep pink, it's a very bright screaming purple. Unless you love purple, you'd better order a different color! I'm keeping the lamp, but I'm definitely going to replace the gaudy shade. I love this lamp except for the Orchid lamp shade as I thought the color online looked pink which I really wanted. Will have to find pink shades elsewhere. This is a heavy lamp for it's size, which is nice because it is less likely to tip over. It is mostly good for decoration and not primary light source because of the pink shade. Very pretty & colorful for a preteen girls bedroom. Arrived on time and very well packed. The colors are perfect for the room. They look great. Gave this as a gift to my godmother as a bedside light. She adores it! Bright, cute, fun! I love it! I love this lamp!! It fits anywhere and it really is cute!! ???????? Absolutely love my new lamp. It goes beautifully in my bathroom. The perfect lamps for my granddaughter’s bedroom. All the colors coordinate beautifully with her bedding and decor. We ALL love this stunning lamp and shade. Pretty lamp for on top of my dresser. Received it fast too! Love this darling colorful lamp! would recommend this lamp - it adds a little glitz and fun to my guest bedroom! I really like this lamp, I would have given it a five star rating but I was disappointed in the colors of the glass balls on the stem of the lamp. From the picture, I expected the glass balls below the lamp shade to have somewhat well defined hues. The colors of the glass balls are very pastel. Except for the center, red ball, it is difficult to tell that they are not clear glass. Our daughter chose this lamp for her bedroom and she couldn’t be more happy with it. She loves its sparkling princess qualities while I love its variety of colors sure to compliment her room for many years to come. thought it was bright pink, actually purple. smaller than measured. very nice lamp. Hi Barbara S., we do apologize for any misunderstanding regarding your lamp's construction. The Prop 65 warning may alarm some consumers. California Law requires this warning be listed on any product that is shipping to the state of California or used within the state. Please note this does not mean that our products could cause cancer however, it is required by the state to display such label on any and all products. This is a warning you may have also seen in most all retail stores and businesses throughout California. The list of Prop 65 is quite lengthy and therefore makes it impossible for any company to test all items that California requires. With that said, this label must be adhered to all and any merchandise sold to consumers within the state. To find out more about Prop 65, Please visit the following link: http://oehha.ca.gov/prop65/background/p65plain.html You can also reach out to our customer service team via phone, email, or chat for more information. Thank you. The shade is not even close to what the picture shows. I thought I was ordering a lamp with a deep red shade. It is a very light violet. The base in the picture is quite colorful. In real, the colors are very muted, not colorful at all. AND Lamps plus makes you pay for return shipping. The least they can do is have accurate pictures. Hi Cheri E., sorry to hear that there was some confusion on the color of your lamp's shade. We will be sure to forward these details to our product team in order to look into this and review. If you need assistance with anything else, please reach out to our customer service team via phone, email, or chat. Thank you.